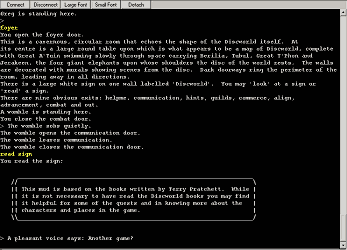 MUDs (Multi-User Dungeons) were born as an online extension of text adventures (now commonly referred to as Interactive Fiction (IF)) and were the first real Massively Multiplayer Online Role Playing Games (MMORPGs). In true retro style these games contain no graphics, and most of them can be played absolutely free of charge. Unlike most of the new graphical MMORPGs that seem to disappear as quickly as they are released, MUDs have withstood the test of time. Imagine if you will, a role playing universe that has had over a decade to mature. Sometimes the old saying is trueâ€”the best things in life are free. Bennett grew up in Australia. I would like to tell you that he lived in the outback, fighting off dingoes and fierce koala bears while he learned ancient game programming techniques from the Aborigines, but that wouldnâ€™t be very good journalism. I can tell you that he attended the University of Western Australia, and learned much of what he knows about programming from the universityâ€™s computer club. He has had many jobs in software engineering and telecommunications, and currently works in Seattle, Washington. On top of his many professional accomplishments, he is also a guitarist and a published writer. To my knowledge he has never harmed a koala bear. 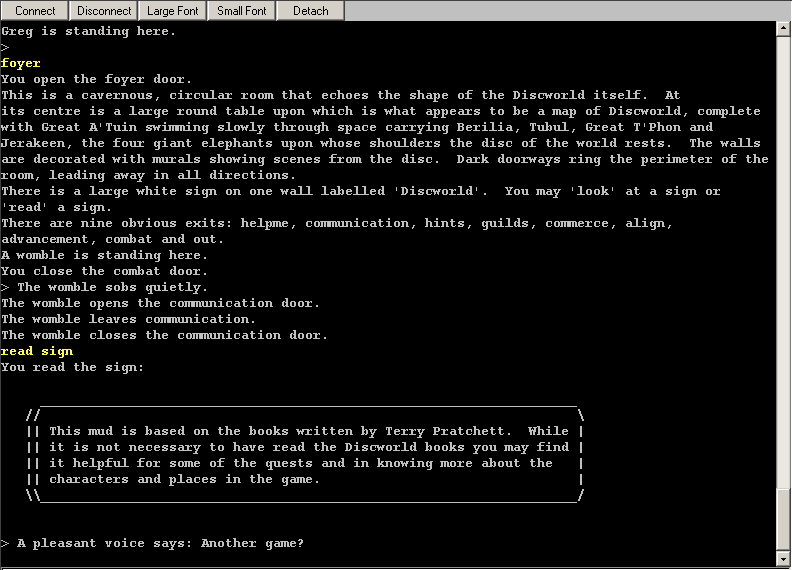 However, good programming and design are just the beginning to a successful game like the Discworld MUD. Getting a project like this off the ground requires dedicated people. Thankfully, there has been no shortage of enthusiastic players and programmers. Over the years Bennett has had help from all over the globe. The good will and camaraderie of the game world has spawned many friendships. The creators and players of the game will often come from all over the world to meet one another in person at one of their annual parties. Mr. Bennett was kind enough to take some time out of his busy schedule to be interviewed by Armchair Arcade. We tried to learn a little more about this man - better known on the Disc as â€œPinkfishâ€ - as well as what it takes to make a project such as this so successful. Armchair Arcade would like to extend a warm welcome to our guest, David Bennett. Buck Feris from Armchair Arcade (AA): I assume that since you have built your own MUD, you must have played a few games in your time. What were some of your favorites and why? David Bennett (DB): Some of my favorite names were Lemmings and Civilization. Before that I got into this game on the Amiga called Bomboozle or something like that. I donâ€™t think many people have heard of it. Before building the MUD I played a few online MUDs, but they always struck me as being very limiting. I tried to write Discworld with the idea of expanding and extending a lot of the code ideas from MUDs. I liked the concept of a MUD, I just thought the implementations were lacking. (AA): Had you designed or programmed any games before the Discworld MUD? If so, what were they? (DB): I had programmed up a few small games before attempting the MUD. I did a version of Tetris and a version of light cycles (Editor: also known as Snake). I also wrote a fairly bare bones operating system for a home built 32000 machine and a fully featured version of basic for the same machine. Those were my two biggest projects before writing the MUD. One thing I should point out is that I never did any coding on any MUDs before I started on Discworld. The Discworld MUD was actually the first MUD-like project where I had any input. (AA): What about Pratchettâ€™s work initially drew you in? How did it lend itself to a multi-user environment instead of something such as a text adventure? (DB): I really like the sense of humour in Pratchettâ€™s work. It is clever and witty while being fairly easy to read and enjoy. It has multiple layers in some ways, you can see it on the surface and if you look a little deeper you can see the parody and satire of much larger things. Mostly though, I just like his humour and timing. (AA): Pratchett states that some of his critics have â€œaccused him of literature.â€ The success of his books comes not so much from his parody and comedic style, but from well developed characters and plots. Have you tried to do this in the Discworld MUD? Could anyone accuse you of literature? (DB): I doubt anyone could accuse me of literature. Online text games tend to have quite a different emphasis than a book. I am not trying to tell a story as much as I am trying to describe a location and an atmosphere. I try to make the descriptions detailed and interesting enough for people to believe they are actually there. I think this is one area the creators and I have tried hard to do well from early on, making the room descriptions very detailed. We also tried to make the game amusing in as many ways as possible, small comments that pop up here and there to keep the atmosphere of the game as light as possible. We try and keep as true as we can to Terry Pratchettâ€™s humour to keep the game amusing and funny. 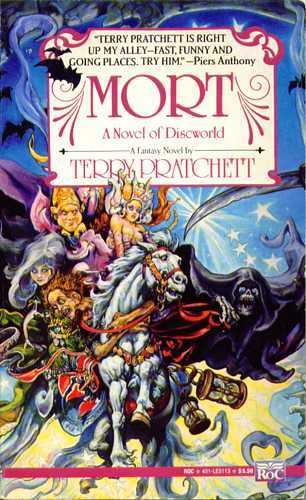 (AA): A few years back, I frequented one of the Discworld newsgroups. One of the interesting things about it was that Terry Pratchett himself often used to post and respond to questions. 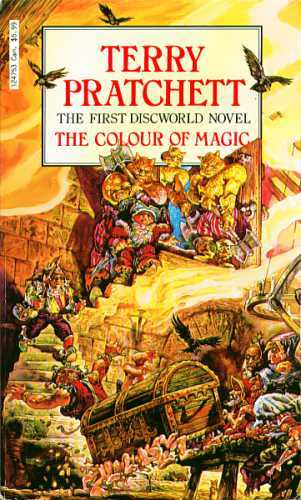 Has Terry Pratchett ever paid a visit to the Discworld MUD? (DB): No one really knows. (AA): While we are on the topic, I understand that you are a published writer yourself. Describe some of your works for us. (DB): I have only been published in fanzines, not in any paying publications. I write science fiction, up to a point. Pure science fiction magazines say my stories are not right for their magazines, but literature magazines also say the same thing. I think I write stories that are not very genre specific. I try to write amusing stories, although my success on that note is somewhat variable. I have some small stories and poems up on my Website (http://discworld.imaginary.com/~ddt ). I also ran an online mud magazine for two years, but I stopped because I didnâ€™t have the time to spend working on it anymore. (AA): Among your other accomplishments, I have found that you are also a rhythm guitarist. Thatâ€™s a lot of creativity for someone who is so technically minded. Do you find the left and right sides of your brain battling for dominance? (DB): I donâ€™t see the division between left and right brain activities all that clearly. I like doing things associated with both sides of that equation. I like playing the guitar but I am also interested in visual arts. I have been doing more art lately, painting of various kinds and recently some stained glass projects. I also do quite a bit of woodworking, making furniture for example. At the moment I am working on making a couple of boats and a cherry dresser for the bedroom. I like making things that are real, which is one quality that Discworld lacks. I also like working on more than one thing at a time. I do finish projects, it just takes me a while. I disagree that programming is specifically technical. There is a lot of creativity involved in coding things up, and doing the design in the first place. The technical aspects help inform your decisions, but I see programming more as a structured creative outlet. (AA): Tell us a little about your technical background. Did your experiences help with the creation of the Discworld MUD or did you have to learn about technologies that were unfamiliar to you. (DB): When I first started coding the Discworld MUD I was still a student at the University of Western Australia. I learned about object orientation and understood its basic concepts. Some friends and I looked at other MUDs running at the time. One of them managed to become a wizard on Boiling MUD, and saw just how badly the underlying mudlib infrastructure was written. This was partly due to the changing nature of the interpreted language that had been used for most of these games (LPC). I was lucky to come into the scene when I did, since LPMud had progressed to a much more useful state for coding at that point. Mostly though, I made up things as I went along, writing things from scratch and my own imagination since there were not many templates out there to follow. Almost everything I did was not based on other ideas. In some cases I had to do a little research on specific types of algorithms, but that was a lot harder before the Web. (AA): Explain a little bit about how an LPMud is different from other types. What are some of the special features of the Discworld MUD in particular? (DB): LPMuds are written in an interpreted language. They are designed to be extremely flexible and extremely easy to modify while the system is still running. This means that bug fixes and updates can be added to the system as it is running. The downside to this is that it is also easy to accidentally break the running code. The other side of the coin to LPMuds is something like a DIKU which uses a fixed code base that has to be rebooted for any changes to be made to the basic logic. As far as special features of Discworld, we have a very strong emphasis on player run and player controlled aspects of the game. We have player controlled clubs and families, as well as councils for imposing laws, housing and shops which are extremely customizable. We have very detailed and interesting guilds and a massive number of original and detailed rooms. There are lots of quests and puzzles to solve, as well as the more classic combat orientated aspects of things (which is also quite detailed). We also have a very strong pervasive sense of humour running throughout the game. (AA): It is extremely hard to control the technical side of a project such as the Discworld MUD. It is even harder to control the human side. Many games like this degrade into a war zone where roleplaying is abandoned. What are some of the techniques you have used to keep the Disc a friendly place? (DB): A lot of the problems with MUDs tend to stem from problems with the administrators. We have been very lucky in that regard, attracting a lot of good people. Although I also think that the style of the game attracts people who are more easy going than some other MUDs. We have a very flat hierarchy, so people are not always jockeying to try and move up to the next abstract level in being a creator (within the creator base) and outside of this politics has little to do with your ability to rise in skill levels. This means people tend to try and make themselves stand out by being very good at something, or specializing in a type of coding. We also have very fixed rules about creators interfering with players. Early on we created a liaison domain whose sole purpose was to deal with player/creator interactions and player problems. Creators monitor and control the public channels and boards, moving things to more appropriate locations if the notes are out of place, and making sure that the language on the public channels fits within PG guidelines. In private we do not restrict what a player does, so long as it is not harassment. You can see from my above statements that I think the main reason why most MUDs end up with problems is political fighting within the administrators and between the creators and players. Anywhere there is a noticeable power gap problems seem to fill the void. (AA): Have you ever had anyone take the Discworld MUD too seriously or spend too much time playing? Have you ever had to intervene? (DB): I have never intervened. We have some controls in the game that let people lock themselves out of their characters for periods of time. We implemented this after many requests from people, since they couldnâ€™t stop themselves from playing. (AA): Running a successful online game for over a decade is something that not many game designers can put on their resume. Your experience would surely be valuable to modern gaming companies. Have you ever thought of entering the fray and doing this professionally? (DB): I have applied to a few companies now and then. Generally most people are looking for commercial gaming experience. However my personal contacts through the MUD have helped me get a few jobs in the past. Problem is, I do not really want to live in most of the places they do game development. (AA): You, of course, couldnâ€™t have done this by yourself. The Disc has many administrators. Who are some of the people who have helped you along the way? (DB): Well, the original group of friends I started coding with helped a lot, they were Craig Richmond, Sean A. Reith and Evan Scott. After this period and a little further down the track there were some people from the UK that helped push Discworld down the right path: â€œBil,â€ â€œZoroaster,â€ â€œBastian,â€ â€œDeutha,â€ â€œSojan,â€ â€œSigneâ€ and â€œDrGoon.â€ In more recent times the administration of Discworld has become a lot more stable with Kars de Jong, Patrick Nyman, Derek Harding, Jake Sebastian Greenland, David Gardener and Robert Boerman. (AA): What advice would you give to anyone starting a project like this? (DB): It takes a very long time for anything to happen, you need to stick with it for the long haul. You should expect that you will have to do 90% of the work yourself for the first few years, until things pick up and other people become interested enough to help. Authorâ€™s final notes: Thanks to David Bennett for taking time out of his busy schedule to talk with us. Hopefully this interview has wet your appetite for a little online gamingâ€”itâ€™s free, needs no installation, and is only a mouse click away. Click here to play the Discworld MUD.